When students come to my university office for the first time, they typically utter, “You have a lot of books,” followed by noting the clutter. For those students, they cannot see the lineage I can now recognize: Go, Dog. Go!, Green Eggs and Ham, One Fish Two Fish Red Fish Blue Fish, Stuart Little, Charlotte’s Web, 7000 Marvel comic books, Arthur C. Clarke, and then that day in my high school sophomore English teacher’s classroom during break. In the mid- and late-1970s, I was a so-called good student, making mostly As and some Bs, but I considered myself solidly a math and science student, planning upon graduation to major in physics in college. Sitting in my English teacher’s room during breaks, we would talk. On one occasion when I was a tenth grader, Mr. Harrill began recommending that I read real literature, and not the science fiction (SF) I was consuming at high rates. Since he knew my parents and what they allowed me to read, he nudged me toward D.H. Lawrence—and thus my transition to literary fiction began. During those same formative years in my teens, my mother and her family had introduced me to The Firesign Theatre, George Carlin, and Richard Pryor. It was books and comedians, then, who have been and continue to be banned that who I am was built on—the reason I have an office packed with books (and even more on shelves at home, and even more stacked here and there waiting to be read since I buy at a rate with which I cannot keep pace) and write every day. So during Banned Book Week 2014, I am compelled to recall some of my experiences with books being challenged during my 18 years as a public high school English teacher in rural South Carolina. Likely my first experience came relatively early in my career when I taught American literature to advanced sophomores tracking into Advanced Placement. I was deeply into John Gardner and learning to write myself so I assigned Gardner’s Grendel. This was a powerful learning experience because it combined a young and idealistic teacher, bright and excited students, the power of a few angry parents, and the essentially conservative nature of public school administration. Several years later, when I was English department chair, we revisited our required reading list, seeking ways to add female and minority authors to the Old White Male canon. We did add Zora Neale Hurston’s Their Eyes Were Watching God, to be taught primarily by our African American female teacher in the department. The first time we assigned Hurston’s classic, a challenge was submitted by a parent, a parent who was a leader of a local KKK chapter. It wasn’t difficult to see through the challenge to the ugliness driving the complaint, but nonetheless, this challenge also exposed the power of parents despite their lack of credibility in traditional schooling. And my final example of the threat of censorship while I was teaching remains the most troubling since the school’s own librarian considered challenging my use of Alice Walker’s The Color Purple in my AP Literature course for seniors, a course her child was scheduled to take the next year. Again, the concerns were being raised by the librarian, who argued with me that the work wasn’t literature despite her own library shelves holding several books of criticism addressing The Color Purple as just as credible as the so-called classics (again, mostly authored by Old White Men). Censorship to shield children. Censorship as a weapon of racism. Censorship as a conservative ideal. I must add here that censorship is even more insidious and pervasive in our public schools in the form of self-censorship—teachers seeking works that will not cause complaints and avoiding works that may be controversial. So banned in the U.S.A. remains powerful often in forms that are mostly invisible, mostly part of the norm feared by Ray Bradbury and dramatized in his Fahrenheit 451. In the 60th anniversary edition of Fahrenheit 451, several of Bradbury’s essays (and a brilliant introduction by Neil Gaiman) are included, one of which notes: “There is more than one way to burn a book. And the world is full of people running about with lit matches” (p. 209). Like Bradbury, Kurt Vonnegut and Sherman Alexie have confronted the power of censorship as well as the misguided desire of a free people to ban not just books, but ideas. And now I write books for teenagers because I vividly remember what it felt like to be a teen facing everyday and epic dangers. I don’t write to protect them. It’s far too late for that. I write to give them weapons–in the form of words and ideas-that will help them fight their monsters. I write in blood because I remember what it felt like to bleed. As a lover of books, as a writer, and as a life-long teacher, I am indebted to my childhood and teenage freedom to read, to listen to, and to consider ideas other than the ones endorsed by my home, my community, and my school. George Carlin and Richard Pryor talked about the world in ways that my parents, my peers, and my community never did; they both praised Muhammad Ali with language both profane and poetic as was fitting for their comedy and for Ali’s own bravado against an inequitable world to which he would not bend a knee—a quality admirable and shared among Ali, Carlin, and Pryor. “A book must be the axe for the frozen sea within us,” Franz Kafka wrote in his Letter to Oskar Pollak 1904. Preserving access to all books for all people, especially children, is at the core of our humanity because the only dangerous idea is the one not allowed. Harrison Bergeron…says so much in such a short piece. Always read Harrison Bergeron. A few years ago, teaching a course on Child Development in the fall, I had students read a book that had been banned, and was intended for young children, or early adolescents. I had them explain what the objections to it were, and give me their own reaction. It was a bit frightening to find how many of them said they would not want their child to read this book — though most at least said they did not object to other people’s children reading whatever it was. Happily, most of them found “In the Night Kitchen” to be a book that need not be banned. Now what banned book should I read today? Hi Paul, I am an avid reader of your blog and enjoy your posts on NCTE’s list serve, as well. As a volunteer for MCTE, I help compose and edit our informal, seasonal journal, the online Michigan English Teacher (eMET). 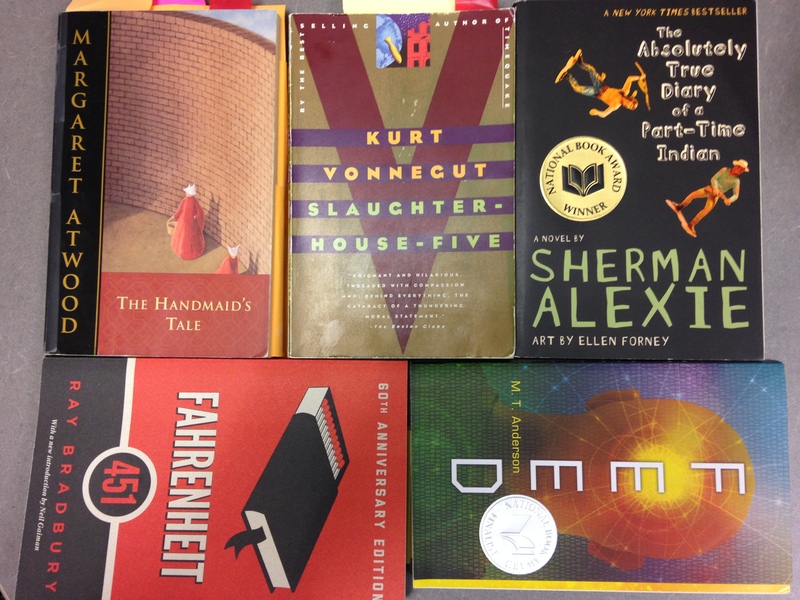 I was wondering if you might consider giving us permission to feature your banned books blog post in our Fall eMET ? Absolutely. Feel free and thank you for kind words as well as your reading my work.